The interventricular septum is the wall of the heart which is located intermediately towards the right and left ventricles. The left ventricle is located relatively posterior towards the right ventricle. Therefore, the anterior wall and a few of the wall on the right portion of the left ventricle are created by the interventricular septum. The septum is made of two parts a muscular part, and a membranous part. The muscular part is thick and creates the major part of the septum. Whereas the upper part of the septum is thin, it is called membranous part. Because of its position over the septal cusp of the tricuspid valve, a third part of the septum is considered as an atrioventricular part. Surface markings of interventricular septum and the anterior and posterior interventricular grooves resemble each other. An angle is formed when it goes obliquely to the left and slightly inferiorly from posterior to anterior. The right ventricle tends to be located anteriorly and the left ventricle posteriorly as a result of this angle formation. The septum is as muscular as the left ventricle throughout the majority of its surface area. It tends to bulge into the chamber of the right ventricle and creates an indentation on the left ventricular side. The septum becomes thinner as well as more fibrous near the aortic valve orifice under the margins of the right and posterior leaflets. This region is termed the pars membranacea septi or the membranous part of the interventricular septum. It is oval in shape. The muscular and membranous portions of the interventricular septum have different developmental origins. The membranous part of the septum is the most frequent location for ventricular septal defects which are generally congenital. Deformities in the interventricular septum are the most common congenital cardiac defect in infants, but before these children are 10 years old most of the defects close naturally. These defects are not as frequent as atrial septal defects in adults. Almost 70% of ventricular septal deformities develop in the membranous part of the septum, where a number of embryonic tissues merge. Because the pressure of the blood in the left ventricle is greater than that in the right, this abrasion is initially related to left-to-right acyanotic shunting of blood flow. The increased blood flow into the right ventricle produces right ventricular hypertrophy, however, and can lead to pulmonary hypertension, eventually creating reversal of the shunt. The basic pathological characteristics resemble those for atrial septal defects. 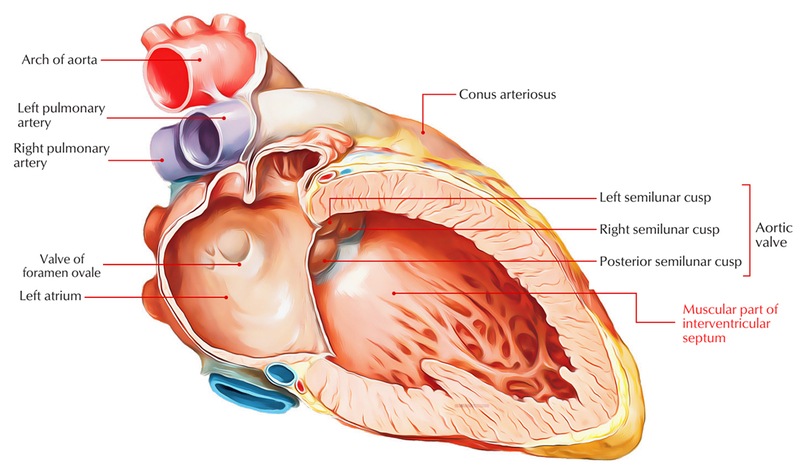 Many of the mutations that cause atrial septal defects can also result in ventricular septal defects, but in addition ventricular septal defects are often seen along with malformations of the outflow tract.